What Causes Ankle Joint Pain While Running? As a quick summary, here are the products that I include below with links so you can check pricing on Amazon. The hip, knee and ankle are the body parts that offer most of the energy required for running. For you to be deemed fit for running, your knee, hip and ankle need to be healthy and functioning properly. For the years I have been researching different ailments I have received from running, I have come to realize that ankle pain is among the injuries commonly developed by runners today. Most of ankle injuries by runners involve Achilles tendinitis or inversion sprains. 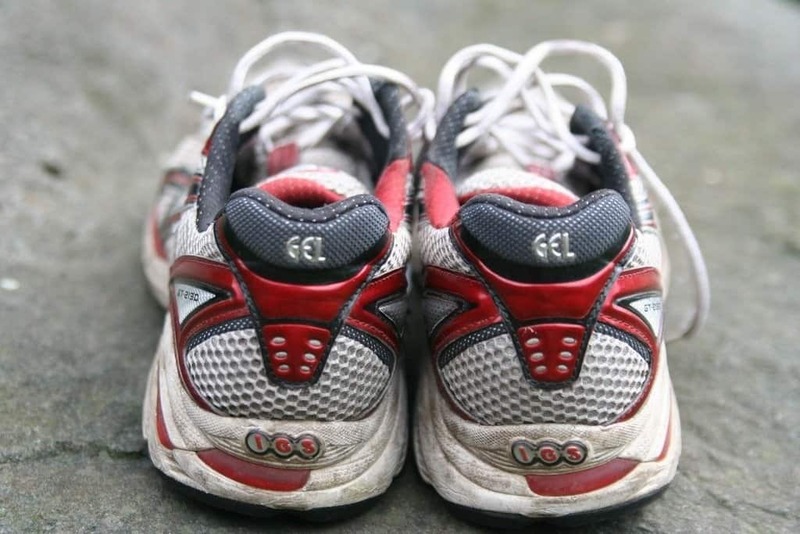 Ankle pain after running may also be caused by blisters. Being a common form of injury for runners, I wanted to share how to treat ankle joint pain from running. 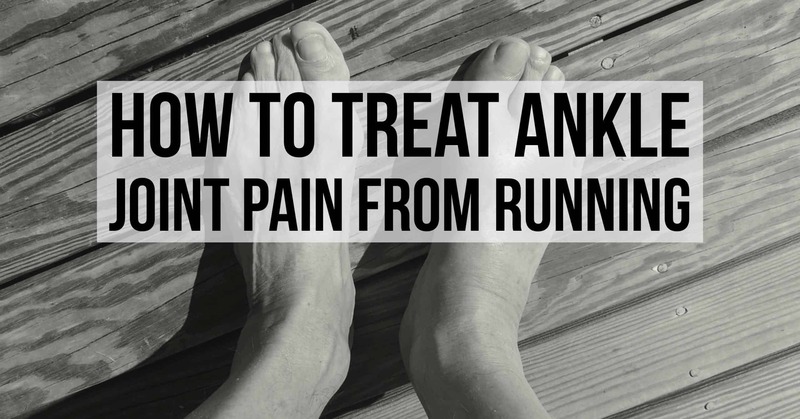 Throughout this article, I will be explaining the various causes of ankle pain for runners as well as the various treatment options available for this pain. Stress Fracture – this is a crack within the bones forming the ankle joint and can lead to discomfort as well as pain for runners. Achilles Tendinitis – this is caused by the inflammation of the Achilles tendon, a tendon that connects the back of the heel to the calf. Common symptoms of this condition include pain and stiffness around the pint of inflammation. Overuse Injury – this occurs when you increase the intensity of your running exercises abruptly. The rapid increase in intensity increases pressure on the bones, ligaments and muscles forming the ankle pain, which often results in overuse injury. Ankle Sprain – this is another common cause of ankle pain for runners and occurs when you twist or roll the ankle while running. This causes the ligaments and tissues surrounding the ankle joint to tear, resulting in pain and probably inflammation. Blisters – pain within the ankle joint after running may also be as a result of a blister on the joint. This can be caused by wearing ill-fitting shoes while running. I break down other causes and relief options for blisters in my What To Do About Blisters On My Feet article. Regardless of the cause of your ankle pain, you need to find help soonest possible. Effective treatment of the aching ankle joint is also required to help it heal and allow you to run once again. Currently, there are various treatments that may be used to alleviate this pain and help the joint to heal. The appropriate treatment for ankle pain in runners will depend on the cause of the pain, and extend of the injury. If you are experiencing pain or discomfort within the ankle joint, it is advisable to refrain from running for some time. This will allow the joint enough time to heal and recover. During this period, you may use alternative exercises, such as swimming. You should also consider icing the ankle joint to reduce pain and inflammation. This is among my most preferred home remedies for ankle joint pain. In this regard, you need to wrap the aching joint using a tape and use supports and splints. This remedy helps to stabilize the injured joint and reduce swelling. The O2 Cold Therapy Gel Pack is one that delivers a cold and is more effective than just placing a cold pack on your ankle. It has a cold compress that wraps around your ankle which delivers the relief on all areas of your foot. The other option I recommend is the Hot/Cold Compress. For those of us who rather have a hot and then cold compress this is GOLD! Many therapists recommend using both cold and heat to work your ankle back into recovery. Not only does this completely cover your ankle but it after inflammation goes down by using the cold, you can switch to warmth that relaxes your muscles. Many medical practitioners will advice various ankle joint exercises to help the joint recover. The various ankle joint exercises, including ankle circles, calf stretches while standing and elevation of the sprain ankle, will help the joint recover more quickly, hence alleviate the pain permanently. Most of the ankle joint injuries that occur while running are mild and may be treated at home. However, other causes of ankle joint pain are more severe. If the ankle injury is severe, you need to seek immediate medical attention. In such cases, the medical practitioners will administer the appropriate treatment, including medication and surgery, as described below. The functioning of these drugs is similar to that of cortisone, synthesized in human body. They are fast in action and are administered to regulate inflammation on the injured joint. If inflammation, as a result of systemic inflammatory disease, is the cause of pain in your ankle joint, the medical practitioner may prescribe oral corticosteroids to prevent the inflammation. If the inflammation is limited to one ankle joint, the doctor may inject the medication directly on the affected area. Cortizone 10 might be the best known over-the-counter cortizone cream. This is a category of drugs that may be used to prevent inflammation following an ankle joint injury. These medications, some of which are administered as prescription drugs, may also be used to treat arthritis—another cause of joint pain. This is another category of drugs that may be prescribed for ankle pain, especially if the pain is as a result of the rheumatoid type of arthritis. Currently, there are about eight biologic response modifying medications that have been approved by the FDA. Such medications may also be used to regulate inflammation, without having to suppress your immune system. In recent past, I have noted that some gout medications have been used to treat ankle joint pain. The gout medications used to treat this condition are the ones that lower the uric acid level in your blood. By so doing, these medications prevent the occurrence of pain and inflammation in the joint after an ankle joint injury while running. These drugs are administered in some cases to help the body form bone and reduce the loss of bone within the affected joint. When used to treat ankle injuries, these medications help the body to synthesize stronger bones within the affected joint, hence preventing the bone from fracturing in the future. For enhanced patient case, it is important to control the pain associated with ankle joint injuries. In this case, Analgesics are some of the commonly used medications to combat pain in ankle joints after an injury. When administered to a patient, these medications make the patient comfortable by inducing sedating properties and promoting pulmonary toilet. It is for this reason that I find analgesics an effective remedy for ankle pain following an injury or trauma on the joint. While the use of NSAIDs is a bit controversial today, they may also be used to control the pain associated with ankle injuries while running. Some researchers argue that the ability of NSAIDs to prevent swelling and enhance the rate of recovery is as a result of the anti-inflammatory effects of the medication. While some medical practitioners discourage the use of NSAIDs, others are using the medication to alleviate moderate to severe pain, especially if the pain is caused by ankle sprains. 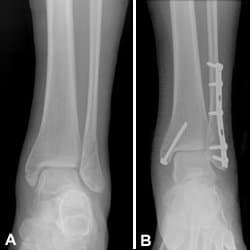 This surgical operation may be used to repair ankle joint bones that were fractured while running. In some cases, this operation involves the installation of such hardware as screws, and metal plates to hold the fractured bones together as they heal. During this surgical operation, the affected joint surfaces are removed. Plates and screws are then installed to hold the bones together. This operation is particularly used on ankle joints that have been affected by arthritis. 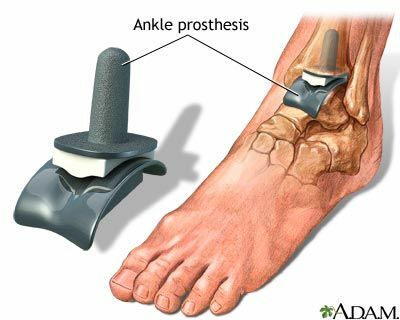 This is a minimal invasion type of surgery that is often used by surgeons to remove cartilage pieces and or bone debris from the ankle joint following an injury. The surgical procedure uses narrow and lighted instruments to make an incision above the affected joint and remove the debris to help the joint heal faster. Although this procedure is less common, as compared to hip and knee replacement surgical procedures, it may be applied in cases where the functioning of the joint has been impaired by an injury or arthritis. During this surgical procedure, the damaged joint parts are removed. The surgeon may also reshape the remaining bone parts before attaching artificial joint parts. Over the years, various medical practitioners and researchers have been helping runners get a quick relief from ankle joint pain. Relief can be achieved through proper diagnosis and administration of the appropriate treatment option. Throughout this article, I have described various treatments that may be used to combat pain associated with ankle joint injuries developed while running. If you have more serious pain or these symptoms don't help, please see your doctor.